In January, True wrote on his Facebook page: "If I were to be remembered for anything at all, I would want that to be that I am/was authentic. No Mas. Run Free!" In June of 2000, a wildfire started in Bobcat Gulch near Drake, before spreading northeast up toward Masonville. Over the course of 5 days, the fire consumed more than 10000 acres in Roosevelt National Forest. 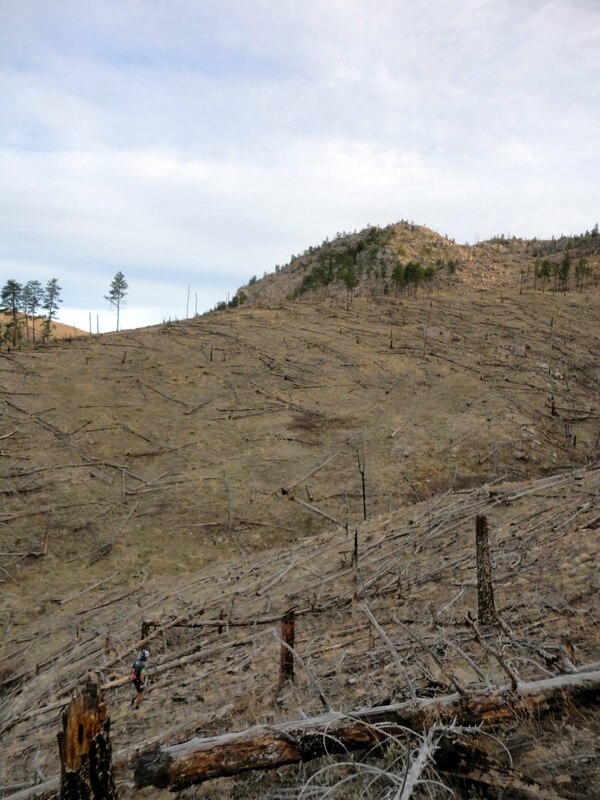 The vast swatch of downed timber, blackened trees, and denuded ridges a full 12 years later serve as a somber reminder of the fire. Still, there is beautiful country buried within, and Nick and I took a leisurely Saturday to explore it. Our planned route suggested a 29-30M loop of mostly trails and some dirt roads, with only a bit of bushwhacking to the first 2 summits, all in perfect, windless weather. As usual, these plans gang aft agley, involving extra-credit sub-summit, some missed turns, and ground conditions that weren't evident in armchair orienteering. It's all part of the fun, though. We began on the trails of Bobcat Ridge, as the sole car parked in the lot: sunrise behind us to the east, and a large herd of elk silhouetted along the valley loop to the west. Glory. We made our way up the Powerline Trail for the first climb of the day, entering the spacious and familiar Mahoney Park, guarded by "Mahoney Knob" up above. Now it was time to climb straight up the ridge along the old Powerline Trail, for new vantage points where we could mistakenly view the wrong summits we intended to climb. First up was Green Ridge, whose name is no longer befitting since the fire. We climbed the next outcropping past Mahoney Knob, thinking it to be a fine summit, but seeing a more obvious, higher summit beyond. Not a problem on a gorgeous day, but it required another descent and similarly slow re-climb through deadfall. (And thankfully, the rattlesnakes are still asleep). The register, in a small pill bottle, was still large enough for several years of names. We now had a direct line-of-site to Spruce Mountain, which required another quick deadfall descent to a dirt road climb. Eager to be running again, we made great time up the dirt road, only to overshoot the direct line up Spruce. Back to a steady hike, we curved back to the northeast, to the summit plateau of Spruce. The plateau itself contains the same characteristic rock and boulder formations down in Mahoney Park, keeping the mind interested in interpreting meaning from the random shapes. Without a clear summit register or cairn, we explored the summit thoroughly for highpoint candidates: every significant digit counts. Satisfied with this, we prepared for our final summit of the day: Storm Mountain, which loomed ahead, at just under 10000 feet, which we planned to reach through the ominously-named Bear Gulch. (If anyone has any young sons looking for ideas of badass pictures to draw, I bet a picture of a bear in front of a mountain with lightning striking the top would be pretty awesome. Just sayin'.). The approach through Bear Gulch was an enjoyable shaded, cool Forest Service road in thick tree cover, which was a nice change on a warm morning. The only drawback was the mud, snow, and ice that slowed progress a bit, but the same probably also is what keeps the place quiet from OHV's at this time of year. I've never heard too much about this area, but I would suggest it would be a prime mountain bike ride in May and June, when it's completely melted out and dry, similar to the Old Flowers Road area. The climbing was steady and obvious, and definitely slow for me. Occasional road junctions and map double-checks by Nick helped give an excuse for me to catch back up to him when needed. The road opened up a few times into various flat, open parks, with Foggy Park being particularly scenic. Knowing we were close, it was obvious that this was the final climb up to Storm Mountain. Nick maintained a steady run, and I think he was prepared to run it all the way up in a final, impressive push, which was only thwarted by shin-deep snowcover on the road. I was looking forward to getting to the top and eating something more substantial than gel, as I was getting a little bonky. The road took us to the top, which would likely be more heavily visited by jeeps in the summer, but was entirely quiet today. It was the literal high-point of the day, but had the most obstructed views due to heavier cover. 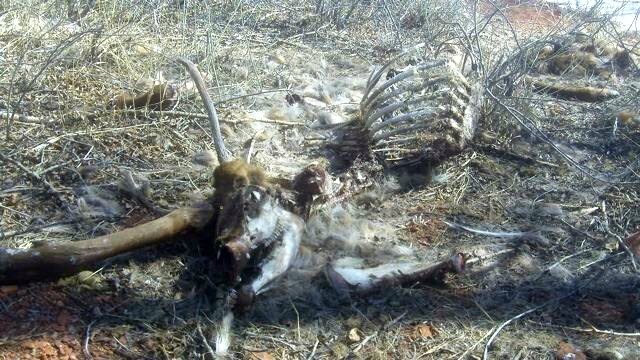 It would still be a recommended mountain bike ride. Now almost 5000 feet higher than where we started, it was time for the long, gradual descent. The slipping and sliding on the ice and snow downhill wasn't helpful for speed, and beat up my feat a little bit in wet shoes. We took advantage of the last sizeable snowfield to refill water, having been a good bottle or two behind a planned schedule. Finally we began descending down Storm Mountain Road itself, into the small community of Cedar Park, and it was an absolutely re-energizing, steady downhill. It felt good to be moving steadily, and it was another reminder of how quickly one can go from feeling a bit run-down to feeling great again -- just get over that last hill and a downhill awaits. We enjoyed the open ranches along rolling terrain and rocky outcroppings that aren't visible from the Big Thompson down below. We made our way generally east through a maze of roads, staying on what was labeled on the map as a Forest Service Rd, before being stopped dead in our tracks by a what appeared to be an abrupt change from the road into several clearly-marked private driveways. Our options were to backtrack significantly, or try to find a way through the woods, which would have been quite tedious. Or, option 3: talk to one of the cabin owners that was out staining his deck. We didn't want to invade his private space, and didn't know what sort of reception we might get -- this is the sort of place for living off the grid, hunting and subsistance living, not running around in shorts and wicking fabric and eating gel packets -- but we tried our luck anyway. Our apprehension was completely unfounded, as the property owner, Mark, was completely cordial and in tune with the surroundings he obviously enjoys living in. Among his 40 acres, besides a beautiful cabin, was a greenhouse, compost heap, solar panels, and chicken coop. He didn't blink in explaining suggestions on how to get back to Bobcat Ridge, or why anyone would take such a circuitous route. In fact, he told us some of the names of the surrounding peaks (that don't appear on the map), and suggested and gave us permission to follow a faint trail through his property that would get us to the FS road on Cedar Creek that we sought. 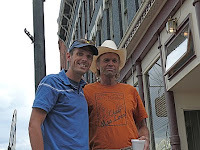 And, very kindly and importantly, he refilled our water bottles, saving us from debating the benefits of dehydration vs. the questionable, muddy water sources that would be our only other option. 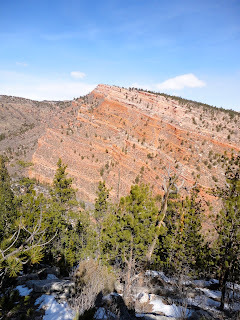 After that refreshing interlude, we managed a bit of extra-credit climbing and unnecessary exploring along the creek, before heading up the road toward the backside of Bobcat Ridge. Finally, we reached the backside of Bobcat, and the familiar scar of the powerlines. Our last climb of the day was complete, so gravity did the rest. We managed to see the Goding brothers at the bottom, chatting with them a bit, before wrapping up the day and preparing excuses for the wives, after a good chunk of time on the feet, and a few more Larimer County Peak visitations. We don't usually go out of our way to celebrate St. Patrick's Day too much, but that was probably the best one in memory, no doubt aided by sunny temperatures hovering in the upper 70s (highly conducive to an afternoon nap in City Park), and a visit from one of our good out-of-town friends. And it began with the annual "Sharin o' the Green 5k" race. The race is a benefit for Partners Mentoring Youth, a fantastic community organization that helps pair adult mentors with child and teenage mentees in order to foster a meaningful relationship of support and encouragement. My family members have been inspirational supporters of PMY, with brother-in-law Caleb having mentored an energetic 6th-grader for just over a year. I've been consistently impressed with the variety of activities Caleb has regularly been able to do with his mentee. More recently, J has been spending time with a precocious 7th-grader, whom I've found to be not just unfailingly polite, but also a great helper in things like baking cookies. (See how the relationships work both ways???) The program is successful because of the great volunteers, as well as the great staff. Since PMY is such a valuable community resource, it's wonderful to see the success of the 5k race. Race participation nearly doubled to over 2700 participants this year, such that registration closed before race day. Also, the course was entirely new this year, with a great collaboration with O'Dell's brewing, such that the race started at the brewery and ended at the same, but with the addition of free beer. My prediction is that the massive crowds might cause some race logistic issues, but the large details went mostly smoothly: ample and close parking in the field behind O'Dells, numerous port-a-potties, and an almost on-time start (amazing with the number of participants). The race was bib chip-timed and worked well (as far as I know) -- by the way, this means the race is quite the "bargain" by having chip timing, free beer, and a t-shirt, for as little as a $17 early registration (LivingSocial deal). It's hard to count pennies when great charities are involved, but this really means that the race organization is quite professional and able to allow for maximum donation to PMY itself (so it doesn't hurt to throw a few bucks into the beer tip jars, for example). But the large crowds did make it quite difficult to navigate a narrow start, and I understand that subsequent waves of people got jumbled up in the usual confusion of dogs, strollers, walkers, etc. Everyone is most definitely encouraged, but all races have an important aspect of etiquette in terms of appropriate starting line positioning, so anything that can be done to aid the process would be welcomed. In my case, it made sense to start near the front. I don't have the esteem to start on the very front line, but I tucked in close enough that it wasn't really an issue. I was happy to see friends and training partners like Nick, Sarah, Tim, and Alex up there as well, having already seen other FCTR's like Celeste, Mindy, and Pete before the race, and did a few strides with Alex to get warmed up and ready. And with a quick set of verbal commands, we were off. Off the bat, I had a brief moment of frustration and bumping elbows (maybe a bit harshly) with a couple guys in a tight but slow wall before the first turn. Soon enough, that was over with, and we were off and running. I kept Nick in my sights (with one runner in between us) just like I would on our fun Tuesday morning speedwork sessions this year, but wanted to keep a controlled and even pace, which I suspected would be 20-25 seconds net back. (My target was 16:45-17:00). Keying off of someone predictable was a great boost, since a few other nearby runners had clearly gone out too fast and started falling back. I was already a good 2-3 seconds back but kept the gap fairly steady in the first mile. I forgot to look at the exact starting time of my $10 running watch, but 1st mile was on target at 5:22-5:24ish, and felt smooth. My injured rib is noticeable on very deep breaths but was basically a non-issue. Next came a few turns and then a brief spot onto the bike path, which required a little bit of work getting around another runner, but was mostly steady. I think I dropped a couple seconds on that mile, but still felt steady. At Mile 2, we overlapped with the first mile of the race, and their were a significant number of runners. Because of the difference in speed and traffic at the start, I heard the girls way past when I thought I would, and heard a few other random name shouts, which was great and kept us honest. But it also meant that there was significant traffic remaining in the first/last mile, which I'm not sure was predicted. As it was, we swung out wide onto the bike path when coming inbound, instead of the sidewalk, outbound route. The route was flawless and non-confusing, but later runners took the slightly shorter sidewalk route as mapped, so I believe the final course for the front-runners was a touch long. (Better than noticeably short, though). One more turn onto Lincoln and it was a straight shot to the 3 mile mark, before a final awkward 180 into the parking lot. I forgot to look at my watch again, but assumed it was sufficiently below 17:00 for the first time in my life. I congratulated Nick quickly, I ended up right behind him, and assumed I'd catch up with him on his race later, though I ultimately didn't get to do so in the crowds. I also missed out on seeing Sarah finish up strong and win her age group, but I was happy to see fellow (fast) training partner Chris who was volunteering at the finish line, and then I circled back and headed out to find the girls. I found them near the 1M mark, and had fun encouraging other runners along the way. They were held up in the first mile but were running at a good clip (with tutus and jewelry and hats on) and having a great time. I peeled off before the finish and then we headed over to the free beer. That was somewhat chaotic, requiring an ID check (as expected) but also race bib tags (after many of us had recycled ours). It was still easy to get the free beer though and $3 otherwise. We met up with more friends then, including some that are just getting started in running or races, so it was great to see them as well. Anyway, I guess that's how you write up a whole 5k race report without pictures, thanks for reading. I was happy with the way this race went, thankful for the organization of it, and now onto working more on the endurance. Alex (WS pacer and math teacher) says the Sharin' o the Green time is exactly equal to a WS finishing time (in hours and minutes instead of minutes and seconds), so hopefully I'm pretty much set in that regard and can start tapering. Well, if I'm going to collect random quotes, might as well share them...and these are very tangentially running related (well, they came to me while running). "I'd rather be winded by a buffet, than buffeted by the wind"
"Atheists are people who don't believe this is a trial run"
"A marriage should be complementary, and complimentary"
"If it's all about expensive race fees, shoes, watches, and other gear, it might as well be golf." "Why the f-ck don't I have an ice ax?" It's been a couple years, but it was nice to get out to Salida for the annual March trail marathon. They changed the course again this year, adding even more singletrack compared to previous years. I was anxious and excited to get an early season race done, especially at a bargain price ($40 early, $50 late). 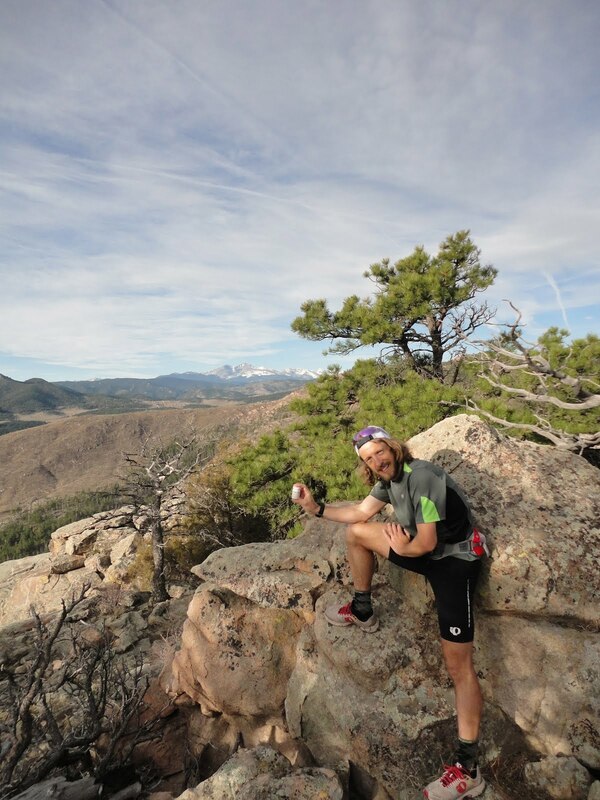 It's also a great time to catch up with different runners across Colorado. I came in late Friday night, and although the Hostel is a great deal, I opted again for chez coche, aka The Outback. There's great, free, easy camping within a few miles of town: head to the edge of town and then drive a mile or two towards Colorado Springs, and on the left side of the road, just past the 4 Seasons RV camping, is some open BLM land. Being a calm, starry, windless night, it would have been nice to sleep completely outside, but it was just cold enough (upper 20s) that I stayed inside, and slept remarkably well. The race also has a casually late start -- 9am, with 8am checkin -- so I was able to get up with the sun and start making some oatmeal and instant coffee. But I still decided to stop into Cafe Dawn for some real coffee. At the checkin and start, it was great to see local FC crew: race favorite Nick Clark, Shaun Blair, Aaron Marks, and Bryan Stefanovic; and other great Front Ranger regulars like PG and NMP (insert blog link here). I enjoyed meeting some of Bryan's friends from Boulder, who had done a combined one (road) half marathon between them -- it was even better to hear afterward how much fun they both had. I did not end up seeing JT at the start, which conveniently added a layer of mystery (for him) as to whether or not he would owe me a beer afterward. With little fanfare, we all assembled by the railroad tracks, for a combined marathon/half-marathon/2-mile fun-run start. The combined start and course meant that the first 2 miles were flat road miles, before going over hill and dale on rocky trail. I decided to push these first couple of miles because they felt so easy, and they went by in somewhere around 13 minutes. Whoops! The only nice part about being aggressive early was that the singletrack was more open at this point, as it was difficult to pass. I passed a couple guys here and then actually ran sort of alone for a bit, on quite enjoyable climbing and rolling singletrack. Eventually, as we hit more shaded snow and ice, and I was probably more conservative, a group of 3: Brandon, Kyle, and Drew -- closed up. I let them pass, but then tagged along as we rolled along on some fun trail Eventually, between 8-9 miles or so in, we popped out on the final few miles of dirt road climb up to the turnaround. Free race photos, courtesy of the race! What a deal! We stayed fairly close as a group for the next few miles, but not before NMP rolled up from behind and blew past. He was looking strong and obviously paced himself well. What a concept! I still felt fine, but knew on paper that I probably pushed a little too hard early. But the 2nd half is mostly downhill, right? So now the race hits a 12.4M mark, then runs another 0.7 before the turnaround back to what would be the 13.8M mark, before exiting the road onto a different set of muddy, snowy jeep track. I stopped briefly for some water and we were split up a bit, and now it was time to see the leaders come down, which is a fun treat at this part of the course. Nick was cruising nicely and looking great, just in front of Timmy. Now I counted other folks as they came through....6, 7, 8, 9...crap. I had a goal of top 10, and there I was, in 10th, with a few guys behind me looking good. So I had my work cut out to stay there. I headed back to the aid station before exiting into the mud. No JT yet, either, so the beer situation was looking good, and I would be able to duck into the woods with him still wondering. Now it was mud and snow, slopping around, trying not to slip but generally having a good time. I guess it pretty much stayed this way for 5 miles, running by myself, trying not to miss any flags -- the course was very well marked. I felt alright here but it didn't feel as downhill as I had anticipated. Finally, before the next aid station, we had some fast, more technical downhill -- but I also heard footsteps behind. I waved briefly and said something, but got not response (later to see he had headphones in, and it was no slight). I went a bit faster than was comfortable, since it was too hard to pass here, and tweaked an ankle briefly before shaking it off. We were blasting down the hills and I felt a little foolish with more than 6 miles left. Soon enough, we hit a junction with the next aid station and came in together. I stopped for a brief bit for a refill and a gel but let him go by. Now in 11th, with nobody else close behind (yet suspecting a small pack of a few guys a few minutes back), I lost a bit of motivation. Oh, and it was time for a final grunt of a climb up from the river. I actually didn't mind this, and caught occasional glimpses of 10th, but when we were back on the downhill, I just felt like cruising and not risking anything. I didn't really know or have any goals at this point, I was kind of in no-man's land. I felt OK but not great. I had kind of thought something <3:30 would be a good goal, but that was out the window (after some significant math calculations). A few casual half marathoners were still out here, and I enjoyed the brief company and cameraderie with them...and then I saw what looked like another marathon runner in bad shape. I caught up to him and made sure he was OK or if he needed anything, he said he was fine but he was going pretty slow. I was glad to see he was OK and now it seemed like I was in 10th again. That buoyed my spirits more than I thought it would, and I picked it up a bit. What a silly magic number, though. Minutes later it occurred to me that maybe that guy wasn't a marathoner (I hadn't thought to check his bib); maybe I miscounted; and how arbitrary the whole thing is, anyway. At least it kept my mind occupied, and then I settled on, How about just finish this race and don't get passed? OK, so that's how it was. I enjoyed the downhill spiral down the mountain, at a fun casual pace but not really pushing myself. I hit the river and saw Shaun there, who had finished the half marathon. At the finish, I was glad to grab some soup, and eventually a 2nd and 3rd bowl. I didn't have any cramps at all but this suggested that perhaps some salt earlier would have been helpful in the heat and sun. We all hung out a bit...and then eventually JT came in...wearing lobster gloves! He clearly didn't cover the 45 minutes he spotted Nick. Now we all hung out a bit, before heading out en masse to Moonlight Pizza. That was JT's recommend, and it was a solid one. Great food, and excellent beer -- tried both the solid Irish Red, and the reliable and cheap (always $2.50) cream ale -- both great choices. Especially when the first one was on JT! Well this is a fun race, and definitely highly recommended -- it's been evangelized by Nick every year, and rightfully so. I was happy with a decent race, and very happy with the organization, trails, and company of the fellow runners. But it's also a good early-season race for lessons, and I learned some of those. I need to prepare myself to keep pushing when it seems like little goals slip away, and I cruised instead of making myself finish strong. I could have pushed it smarter (slower first half) yet harder (downhill), and I have more trail training to do. That's great to know -- it's only March! After Saturday's fun and sunny Salida Marathon, I was looking to do get up high Sunday morning. It's almost the end of winter, and I hadn't been up any 14ers, which is a shame in this low snow year. Since I was already in the Sawatch, something down there made more sense. By Friday, I was leaning heavily towards Antero, as the weather forecast was very favorable, with sunshine, 30-degree temps, and low winds. I didn't bring my skis or any sort of flotation, expecting to stick to running a packed trail. My legs felt fine after the race, so it seemed like a good opportunity. But as the afternoon wore on, various details piled together that convinced me to scrap that plan. The biggest part was the updated weather forecast: sustained 20-30mph winds, gusts up to 45mph. Ugh. I still drove up toward Mt. Princeton Hot Springs to check things out, and saw the snow still piled up in the trees below the trailhead. Finally, there was a ridge section on the final summit push that had some Class 3 (because the trail was covered in snow) and possibly traversing a short section of snow field. Putting this together, I would have to slog a bit up until treeline (though I did read it was mostly packed), be exposed to the wind for several hours, and have to bring my ice ax with me the entire way for a couple of spots. 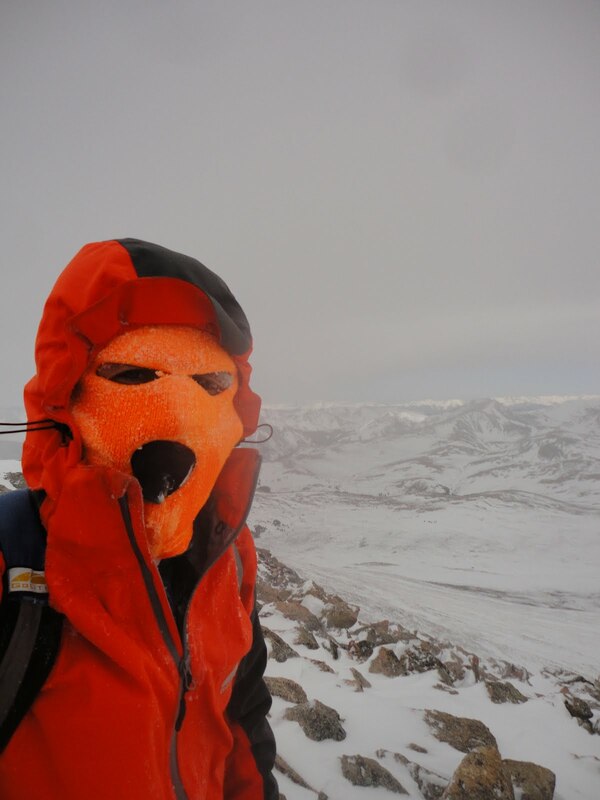 Frankly, I'd had enough of the wind this year, and when several factors start piling on together (in addition to being fatigued and solo), I began to realize there was a chance of not summiting and not having sufficient fun. (Note: Later I read that it was a 13-hour day for one guy on Saturday, which had perfect weather. But also, Mt. Princeton via Tigger was perfectly packed and mostly dry on Saturday, meaning the only factor would have been possible wind. That would have been the best option. So I aborted that plan, and came up with Plan B: Mt. Bierstadt. This is an appropriate emergency backup option because I've considered Bierstadt to be an abortion of a mountain. I've previous called it an "ugly, unspiring, and bulbous mass," and the summer finds it loaded with bucket-listers and tourist gapers, with not a moment for silent reflection between the crowded parking lots and toilets below and the mass above. But it would at least be uncrowded* and relatively safe for a winter ascent, and be closer to home so I could get back in town early in the afternoon instead of late at night. (*Hypocritically, the popularity, even in winter, helps pack down the trail through the willows so that I did not need flotation. Yes, I'm quite aware of this irony, and thankful for the previous hikers). So I pulled up Guanella Pass and drove to the closure, joining one other parked car, and then slept for the night. Being Daylight Savings Time, I woke up an hour later, by government decree, yet no more refreshed. Another few cars had assembled, and I saw 2 parties take off, as I leisurely got ready, heating up some water for oatmeal and coffee. Hmmm, it's cloudier than I expected... I met another couple getting ready to head out, and noted their Packer hats, chatting with them briefly about our shared homeland. While I wasn't adorned in any Packer paraphernalia, I did have my blaze orange facemask, which is about as common in Lambeau Field crowds in November as green or gold. Fittingly, as we headed off, it began to snow. I jogged lightly up the road, about 2 miles from the Guanella Pass trailhead. This extra credit jog would mean about 10 miles on the day, and put us over 3000 feet of gain total, which is another pleasant reason to head up here in winter. Near the parking lot, I saw the group of 3 women that headed out about 20 minutes before me on snowshoes, and the solo gentleman who was crossing the willows. I chatted with him briefly before heading onto the trail. The willows are infamous, and Gerry Roach has a hilarious take on them in his classic 14ers book. Apparently, there's a significant improvement with boardwalks through some of the boggier areas. In the winter, the reality is deep snow and postholing. However, on this day, with more recent traffic than snow, the trail was in prime condition. Stepping off to the side would lead to waist-deep snow, but postholing was otherwise avoidable. The willows weren't a problem at all. After this flat section, we began more actual climbing, as the trail proper switchbacked upward. The wind was picking up more now, from the southwest, blowing small pellets of snow and stinging my eyes. I had planned on sunglasses combined with balaclava and facemask to be sufficient, but had no excuses for not having brought goggles instead. Visibility was now getting poor, and I used the occasional posts to spot the trail, but soon enough the trail itself wasn't clear. I've read about mistakes of returning too deep into the drainage, so I occasionally turned around and made out the view as best I could of the descent, knowing that my footsteps would be obscured by the wind. I saw another hiker up above, greeted him briefly, and headed on -- shortly after that, I never saw him again, so I questioned my choice of route. After climbing for a bit, I saw a party of 2 up ahead. I couldn't tell which direction they were headed, but I headed towards them, and a large cairn behind them, suggesting I was still at least near the route. They were now descending, and I asked how it was up there. "We just went up to the cairn," they said, "and decided to turn around, since we can't see anything." I agreed that it wasn't a bad idea, but kept on, and they told me to be careful. That made me feel a bit more lonely. 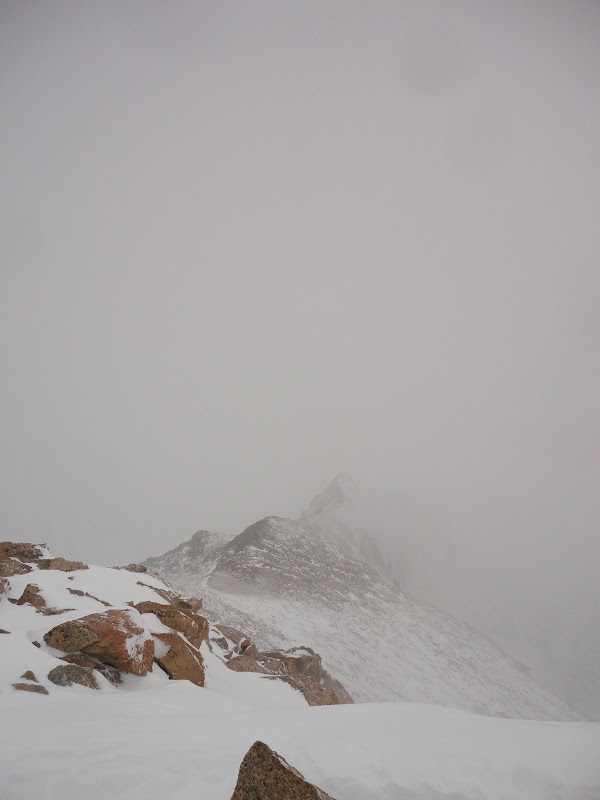 The summit itself was nowhere near to be seen, but hey, It's just Bierstadt. I still didn't need my microspikes, but slipped a bit on the snow. On one spot, I feel face first and landed squarely on my water bottle, which jammed against my ribs. I decided to stop at the next large rock, add a later of clothes, and put on the spikes. The wind was not excessive or gusty -- maybe 20mph sustained -- but consistent and cold enough that 20 seconds of skin exposure would mean another couple of minutes of jamming my hands into my armpits or crotch to warm them up again, just so I could fumble with things like zippers. I eventually got everything in order and headed up into the great white unknown. Finally, I the terrain was noticeable larger talus, and I recognized the final ridge, with a large windbreak and several large cairns. There's a short section of class 2 here, but it was a bit more fun and motivating to be near the top, while peering over the cornices and dropoffs to the right. I've already seen, and evangelized, the fact that the views in that direction are better from Square Top Mountain, and now I can say with certainty that Square Top is also hands-down a more enjoyable and scenic hike than the Bierstadt standard trail. But, I've softened a bit on Bierstadt as a whole. The Sawtooth certainly looks like a fun route, and the views in that direction from the summit are an enjoyable treat. Bierstadt can be a fun, light winter-mountaineering trip in the winter, as well as sunrise/sunset/full moon hikes. Or, just chilling out and being leisurely or goofy in the summer, I imagine. It's still a nice area, so I could see coming back for Wilcox/Argentine, Grey Wolf/Spaulding, and other such loops. Now, as I descended, the weather became markedly improved. The wind nearly stopped, and felt warmer when it did blow. Occasional sun replaced snow, and I could have kept my gloves off the entire time and still been comfortable. What a significant change in conditions in about an hour. I could make out the Packer duo headed up the mountain still -- glad they pressed on toward an even better weather window. We chatted briefly and they asked how the summit was, so I did a discount double-check Aaron Rodgers touchdown move. Then I bounded down the mountain some more in Microspikes, feeling much more alive in the better weather. As I descended, I did notice my ribcage hurt even more than it did before, especially when taking deep breaths or bending or twisting. That could have been more serious, and still hurts today, but seems to be getting better. What a lame injury, and I think I'll store my water bottle in a different place and try not to fall. Bierstadt. Did I really just type a whole Blog entry on it? I guess I did. Lifetime has already ensured that corporate executives of companies with > $1 million in revenue can buy their way in, had a controversial (well, among maybe a few dozen people in the world) incident last year in which certain people received special treatment in allowing for outside aid and cutoff times, and briefly offered pre-paid post-race IV bags (before pulling due to criticism). 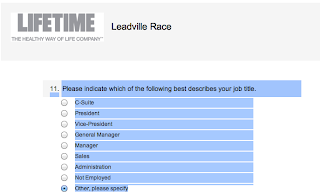 So I really enjoyed the Leadville marketing survey, which was all demographics (income, etc. ), spending (races) and nothing about training, performance, etc. The best part, though, is the jobs: 5 out of 7 listed being management (and the other two being important but additional peripheral meta-jobs)...with distinctions between President and just Vice President, dontcha know. Medical researcher? Doctor? Lawyer? Teacher? Engineer, IT? Fireman, paramedic, police? Artist of any kind? We're all lumped together under "Other." I can't recall a survey that didn't at least have "Education" or "Civil Service" or "Military" or other large swaths of the population. But, it's their survey, and I do get whom they're targeting -- just not what I look for in a race. The changing of February into March means the re-opening of Red Mountain Open Space, which is closed seasonally from December through March. I hadn't made it up there yet -- it's a solid 25 miles north of Fort Collins -- but was eager to do so. I pointed Nick at the nearby peaks on the Table Mountain quad, and we decided to go have a look. As we made our way up north on dirt roads, the city scene gave way to a positively pastoral landscape of ranches and rock. The closer we got to our destination, almost at the Wyoming border, the more impressive the surrounding terrain became. Unfortunately, the wind was Wyoming-like, as well. Table Mountain is a steep but manageable walkup. Unfortunately, it was miserable in the wind, and it was absolutely howling down below on the west side of the hill. Downclimbing wasn't a good idea, since there were times while hiking or running when a quick, surprise gust would blow your leg or body in an unintended direction. We tried to discuss a plan, but you couldn't even hear a person talk. Then, the wind picked up some more, so you couldn't even think, as your thoughts blew away before you could even think them. So we went back down to the trail, and decided to stay low and run around a bit. Of course, as such things happen, it wasn't that bad once we had retreated to the valley, so we discussed options, and decided to head back south again and then toward 7178'. The wind was still bad, but at least on stable trail and dirt tracks, it was more manageable and enjoyable. The climb up 7178' is actually fun, with a steep grind up a dirt road, surrounded by red rock terrain giving way to a forest of pines. With renewed vigor, more running, and less wind, we headed north for further exploration. As we saw a tilted slab of pink sandstone topping out above the trees, we instinctively headed towards it, thinking it was another ranked summit. After more significant work getting towards it, and climbing higher through the trees for a better view, we realized that it wasn't just any gulch in our way; rather, the steep, sheer 500' walls of Boxelder Creek. 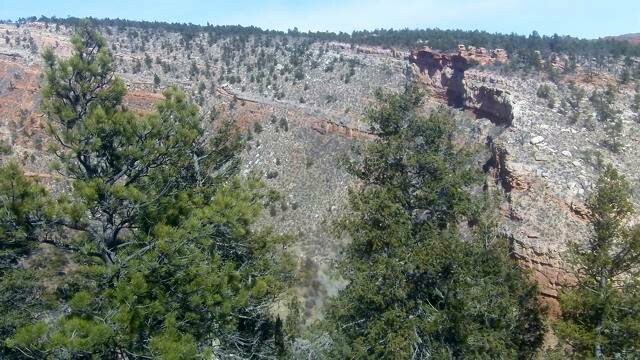 This meant that we had no choice but to descend safely to the East, parallel to the canyon, and that we wouldn't have time to head further north, but the spectacular views of the canyon were worth it. We then dropped down next to a sheer drop that was obviously worn smooth by water, with a dry bowl at the bottom -- although completely dry, this was clearly an intermittent waterfall, shown on the map, which would be quite impressive during the spring. Heading back East, we were impressed by more bright red rock -- how exquisite to have something like this so close to Fort Collins! It is more reminiscent of Fruita, Moab, or Vernal, than typical Northern Colorado scenery. Sure, Red Rocks Park and GotG are impressive, but desecrated by concrete and gapers. We finished up with a bit more running on the trails. The scenery along the Bent Rock trail alone -- short and non-technical -- is definitely worth a visit for anyone. Just be mindful of the wind -- it can get so bad at times, it can rip your hide right off!